I was out of town for a few days, then I came home and had a sick kiddo. Two days later, I was sidelined with a bout of the stomach flu. I feel like I have been out of touch with the world for weeks. We went to a family reunion at Campus Retreat in Albion, ID. My husband’s grandma attended the Albion Normal School back in the day. When the state shut down the school, it bounced through a few owners, then stood vacant for almost forty years. 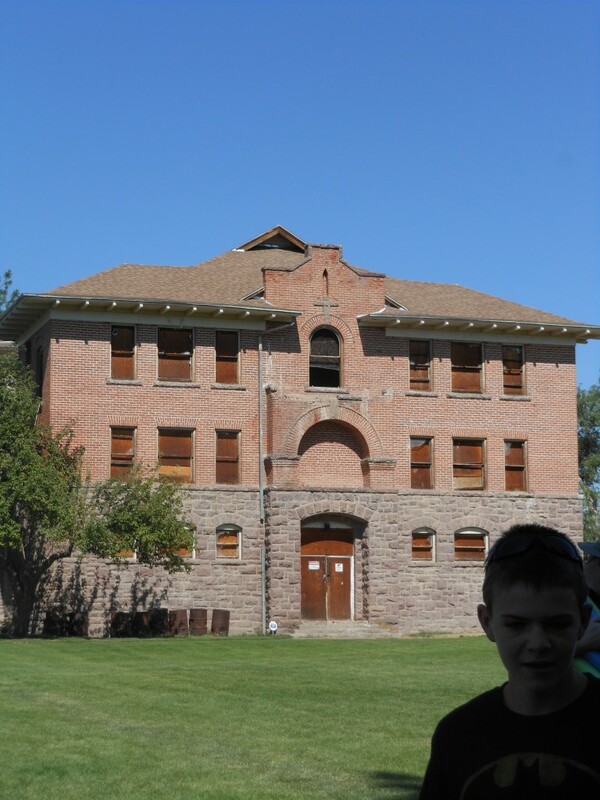 The buildings on campus are amazing turn of the century brick buildings. It’s tragic to see them in ruins. However, the current owners are rennovating the campus one hall at a time with the goal of making it a retreat, convention and wedding venue. It’s a beautiful place. 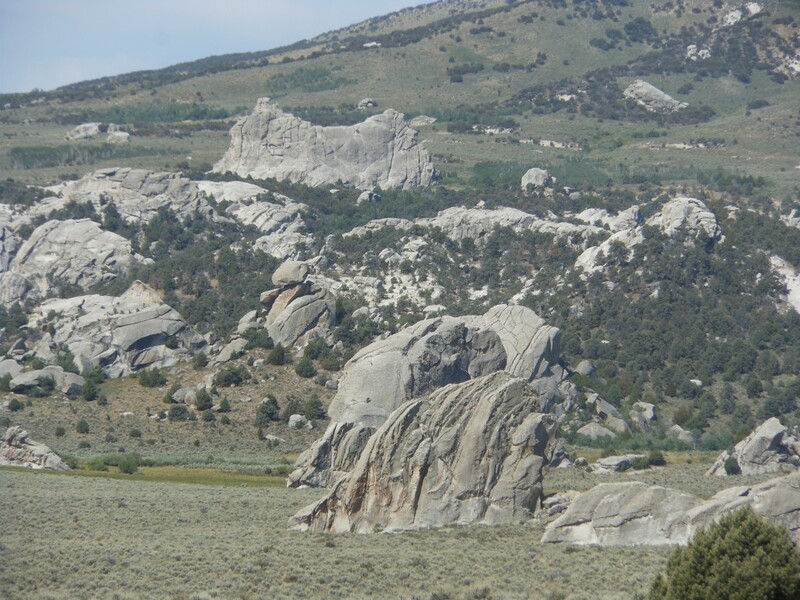 Albion, Idaho, is near City of Rocks. Now, by the name, I confess I wasn’t all that excited to visit. I mean, really. I can see rocks all around me. 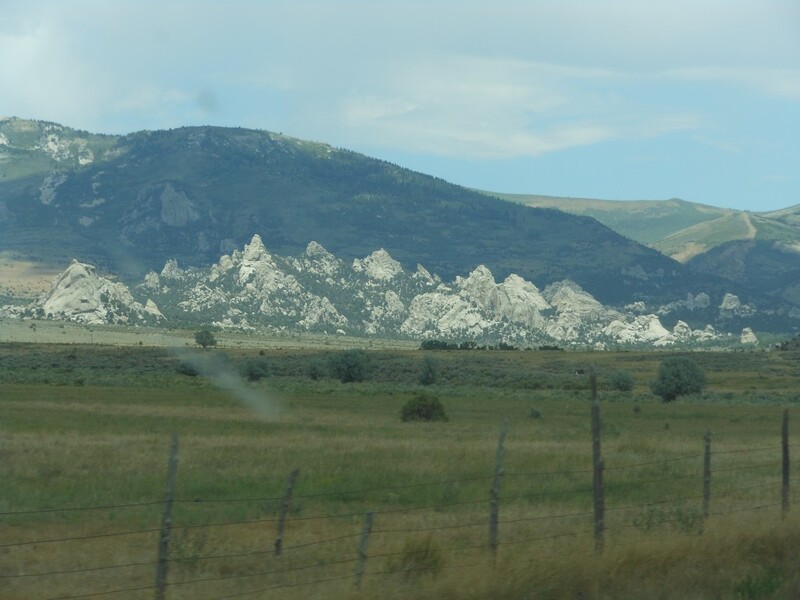 I even saw photos of the City of Rocks, and I wasn’t that impressed. Like most natural wonders, you have to see it with your own eyes to appreciate it. 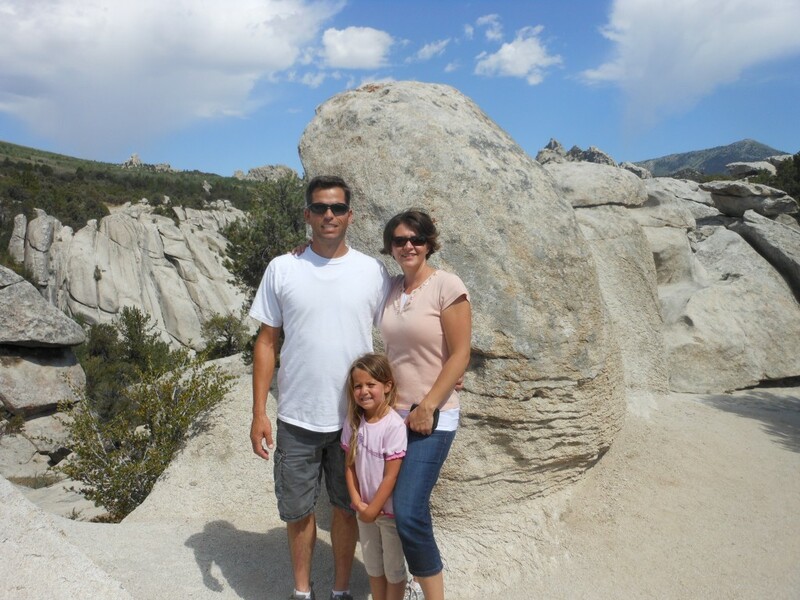 City of Rocks was a well-documented landmark by western emigrants on their way to California. There are hundreds of journal entries that talked about coming to the valley where the rocks rose up like the ruins of a city. The travelers named it the City of Rocks. This rock became a guest book of sorts. The back side was covered with hundreds of emigrant signatures. An information board showed a photo of the rock in 1930 and 1990. The signatures are fading, but many are still clearly readable. They didn’t have Sharpies. I wonder what they used to sign? Other rocks? Charcoal would have washed off. Here we are at the Inner City. 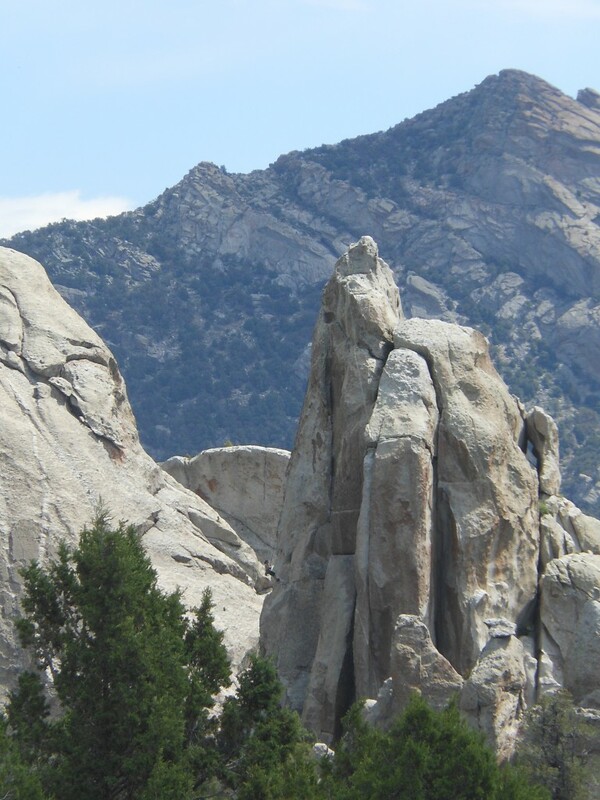 The City of Rocks are granite formations, and they sparkle in the sunlight. Very cool. It is also a playground for rock climbers. Can you see the climber on the face? Last, but not least, Castle Rock. It makes me appreciate the wonderment and vision of those travelers who walked all the way across this vast country. They looked at these landmarks and they saw ruined cities and a castle instead of just rocks. It makes me wonder sometimes, what am I missing in the landscape around me? Sorry you were sick. Great pictures, though! Thanks. It was a fun trip. nice pics. Sites like that are always more impressive in real life. Photos just can’t do Mother Nature justice, can they? Thanks for stopping by. Hope you will return soon! 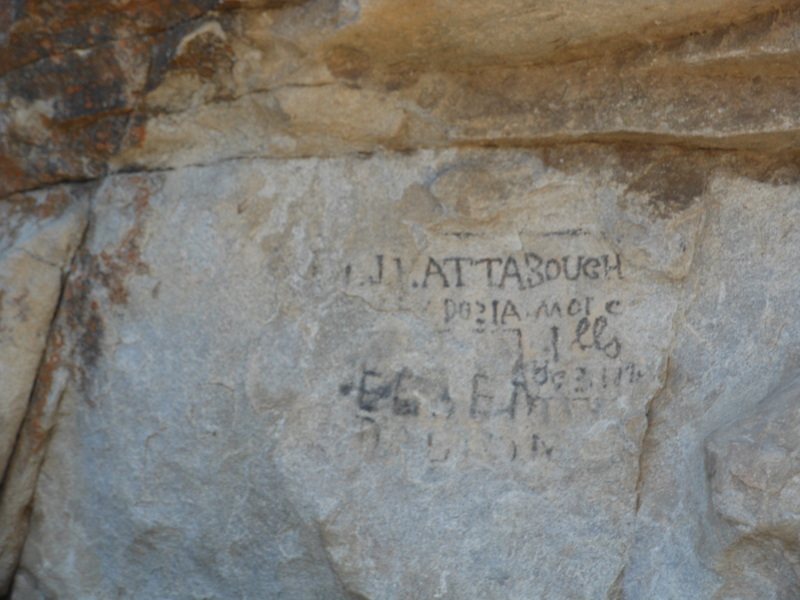 I believe that they used axle grease from their wagons to write their names on the rock. It think they call that Register Rock. They liked camping there because of the available water and feed for their livestock, plus they enjoyed exploring a little I’m sure.